Anything and everything about books and the reading experience. 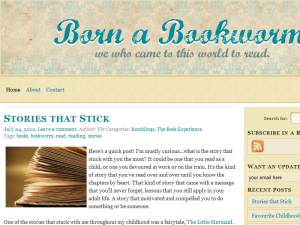 This what your Born a Bookworm Blog Ad will look like to visitors! Of course you will want to use keywords and ad targeting to get the most out of your ad campaign! So purchase an ad space today before there all gone! Here’s a quick post! I’m mostly curious…what is the story that stuck with you the most? It could be one that you read as a child, or one you devoured at work or on the train. It’s the kind of story that you’ve read over and over until you know the chapters by heart. That kind of story that came with a message that you’ll never forget, lessons that you still apply in your adult life. A story that motivated and compelled you to do something or be someone. One of the stories that stuck with me throughout my childhood was a fairytale, The Little Mermaid . I wanted to BE a mermaid, live under the sea, munch shellfish, sing and comb my hair all day. It was such an influence in my life that I ended up writing a thesis on mermaids before graduating from Uni. I have read many stories and books since then and I have become mildly obsessed with them (Matilda , Harry Potter , Memoirs of a Geisha), but none of them have stuck around as long as The Little Mermaid. What’s the stickiest story you’ve read? The books we read when we’re small can help form who we grow up to be. Depending on our choice of reading, we can either become inspired or traumatised. Before I even learnt to read I remember bedtime stories being read to me, or when there wasn’t time for that, an audio book was played which would send my sister and myself off to dreamland. I remember being read the usual stories: The Three Little Pigs, Little Red Riding Hood, The Little Mermaid etc, but the tales I remember the most fondly were those created by Beatrix Potter. My parents had bought Beatrix Potter: The Complete Tales along with the audio cassette tapes that were played every night when my sister and me were tucked into our beds. I remember the adventures of Peter Rabbit, Tom Kitten, Pig Robinson, and I even imagined I was Mrs. Tittlemouse with a tiny little house that had to be kept squeaky clean. Beatrix Potter was a huge starting point, as were all illustrated story books. It’s one of the main reasons why I decided to become a Graphic Designer/Illustrator. Many children find the inspiration for their future in story books, which is why writing them and illustrating them can be quite a large responsibility. As I got older I began to choose books for myself, and I discovered Asterix the Gaul and Roald Dahl . I remember wanting to Be Matilda so I devoured book after book and imagined I had her extraordinary mind power. With Asterix, I fell in love with the drawing style of Goscinny and Uderzo and avidly followed the adventures of this little Gaul and his large friend, Obelix as they bashed Romans about. There are many many more examples that I can list, but I’m more interested in what books shaped you as a child. Which was your favourite? Which was the first book you remember reading? My first book review on this blog and hopefully many many more will follow! I recently obtained a few Laura Kinsale books for some leisurely reading and yes, They’re in the romance genre. I’m sorry, but I have guilty pleasures just like anyone else! Don’t judge me! Anyway, before you start to scoff and open a new tab or window or whatever, I’ll have you know that this story isn’t your typical romantic mush. And that’s why I’m writing a review on it. And also why I’m going to be reading a lot more Laura Kinsale from now on. Hero introduced/heroine introduced – hero and heroine meet – fall in lust at first sight or hate each other on sight – insert random situation to throw them together for any amount of time – they do the nasty – insert plot twist/forced separation during which one or both realizes they’re in love – emotional encounter and marriage, the end. There may be some small differences, but that’s the gist of it. Now, onto the review. Let me just give you the general idea of what it’s about. Set in the early 19th century, the protagonist, handsome yet reckless Christian Langland, known as the ‘Mathematical Duke’ of Jervaux due to his genius for equations, becomes a stroke victim while participating in a duel. Due to the medical practices and lack of thorough knowledge on mental illnesses at the time, Christian’s family deems it safer to put him in a ‘madhouse’, believing he is suffering a moral breakdown as atonement for the sins of his past. Archimedea Timms, a deeply religious young woman, member of the Quaker community, had been working with the young duke who would correspond with her blind father concerning mathematical problems right up until his stroke. She arrives at her cousin’s insane asylum to help him tend to patients and while there, she discovers and recognizes Christian whom she had thought dead. After spending some rather volatile moments with him (he can’t really control himself on account of his condition) she realizes that he isn’t mad, his mind is still there, which the duke himself demonstrates with his grasp for mathematical issues, but he is imprisoned by it. Archimedea, or ‘Maddy Girl’ as Jervaux calls her, decides that it is her God-given responsibility to help Christian recover, yet throughout the story she battles constant doubt when drawn into his world, a world of wealth and extravagance. Christian puts himself entirely in her hands and his vulnerability forces Maddy to stay by his side. His family is constantly attempting to declare him legally insane, forcing him to hand over his estate to more competent members, yet Christian struggles to regain what he has lost and stands to lose and we see his improvement with each chapter. However, we also see the downward spiral of Maddy’s beliefs, since she feels she is betraying her Quaker faith by sticking with Jervaux and accepting his extravagant lifestyle. • Jervaux, Jervaux, Jervaux. I love this character who is so well written that I feel drawn into his constant struggles to control his own mind. • The pacing…at times I would feel so frustrated at the tension between the two main characters and the fact that nothing would ever seem to happen to further their relationship, but that’s what made this book more pleasurable to read. • You are literally drawn into Jervaux’s mind from the start, and the way Kinsale writes his illness makes it incredibly believable. You are given an insight into the workings of his brain throughout his efforts to overcome his condition and as the story continues you are able to observe the most subtle of improvements. • Maddy, Archimedea, Maddy girl. However you are called my dear, I just don’t like you. At first you acted like a true helper, but after you were exposed to the luxuries of the duke’s world (and found out you liked them), you became just plain intolerable. It was your constant indecision and threats to leave poor old Jervaux and your closed-mindedness that made my dislike for you become all the more intense. I had to constantly keep in mind Maddy’s religious upbringing to stop me throwing the book against a wall every time I came to another paragraph of her whining. I would rate this book 4 stars out of 5, taking a star off for Maddy Timm’s infuriating behaviour during a good half of the book. But she seems to be a nice girl though. Don’t let my complaining put you off reading the book and judging for yourself. It’s been a while since I last posted, I’ve just been getting things organized (work, family, work) so that I can pay more attention to this blog. I’ve got lots of new reading material and a couple of book reviews to share with you, can’t wait to get started! Yes, we bookworms like to read a lot and virtually anything, but there are some consequences that come with subjecting our eyes to so many ‘to and fro’ movements. I wouldn’t be surprised if a lot of you wear glasses, as I do. • Use a good light when reading. The best kind of lamp would be one with a flexible neck and frosted bulb to reduce glare. Avoid fluorescent lights like the PLAGUE. I found an article on the 10 Best Bedside Lamps for Readers which shows a collection of rather intriguing designs. • Exercise your eyes to reduce eye strain. This works for those who have to ogle computer screens all day as well. I find that simply removing my glasses helps a lot to rest my eyes and prevent them from working so hard. • Take regular breaks and stare at something else for a while. Yes, I know, some books are impossible to put down and if it’s that hard to tear your eyes away from the page, set an alarm to distract you after an hour or two. Taking care of your eyes while reading is simple. I haven’t cut down my reading…in fact I’ve increased the amount of reading I do but my eyes don’t suffer (too much). We only get one pair of eyes so it’s a good idea to treat them well if we want to keep reading right into our old age! My sister bought me The Tale of Genji for my birthday and I’m still on the first few chapters. This story comes in two volumes (the translated version by Austral Editorial) and each volume is about 800 pages long. 800! That makes a total of about 1600 words altogether. I love how they stay true to the Japanese theme using traditional artwork instead of photoshopped pictures. Though you can’t see it in the photos, the book covers have a lovely texture that makes you just want to pick the books up and smooth your hands over them. What don’t I love about this present? Only one thing: it’s in Spanish. I’m bilingual but Spanish takes me longer to read, especially when we’re talking about translated books. The Spanish used is from Spain, which means that there are many strange terms that I’m not familiar with. Ah well. Let me tell you a little bit about the author of this book. She lived over a thousand years ago and her nickname was ‘Murasaki Shikibu’…her real name remains unknown. She was a lady-in-waiting at the Imperial Court during the Heian period and during her life there, she wrote The Tale of Genji, which is considered to be the world’s first novel. Pretty impressive, no? About the story…it centres on the life and (many) loves of Hikaru Genji, the second son of the emperor of the Heian period. He starts off chasing after his stepmother at a young age and continues on to have dozens of affairs with many women. he has some ‘mum issues’ and continuously searches for his long-dead mother in all the women he becomes involved with. This novel contains various karmic and spiritual vibes due to the religious practices of the time, but a lot of it is quite illuminating. The novel continues with Genji’s descendants, and ends on a spiritual note, but since I haven’t gotten that far yet, I don’t know what it is! Have any of you read this story? Any comments on it? You know something I like to read? Diaries. Not like a stalker or an annoying sibling though…I’m talking about real diaries about real people who have gone down in history for recording bits of their lives. I’m talking about Anne Frank. I’ve read her diary many times, and a couple of other books that talk about her family. It’s strange how such a young girl could have been so mature for her age…after reading her diary, I thought about how I had filled pages and pages of notebooks with utter rubbish. Of course, when you start reading her work, you can’t help feeling a little annoyed at her attitude (she was a right Miss Popularity!) but once she and her family go into hiding you become completely absorbed and you discover traits of her personality that you later find extremely admirable. Why do we like reading other people’s diaries? It’s that nosy part of us that likes to find out all the juicy bits of a stranger’s life, as long as they’re interesting. There’s nothing worse than a boring diary. A boring diary means a boring life…and maybe this is why some people like to lie to their diaries about certain things. Do you keep a diary? Have you ever read someone else’s? Please share! If you are the owner of Born a Bookworm, or someone who enjoys this blog why not upgrade it to a Featured Listing or Permanent Listing?